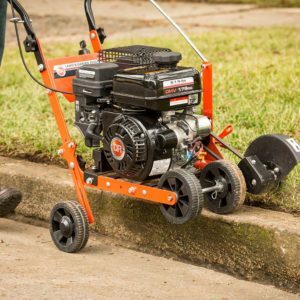 A steel-bladed lawn edger is a professional tool for creating sharp, clean edges along walkways, garden borders, around trees. Plus anywhere else on your property where you want the precision of a well-defined cut. Professional edging defines these areas crisply and goes after the roots which, with most other edging techniques, are left unmolested and therefore need constant maintenance. 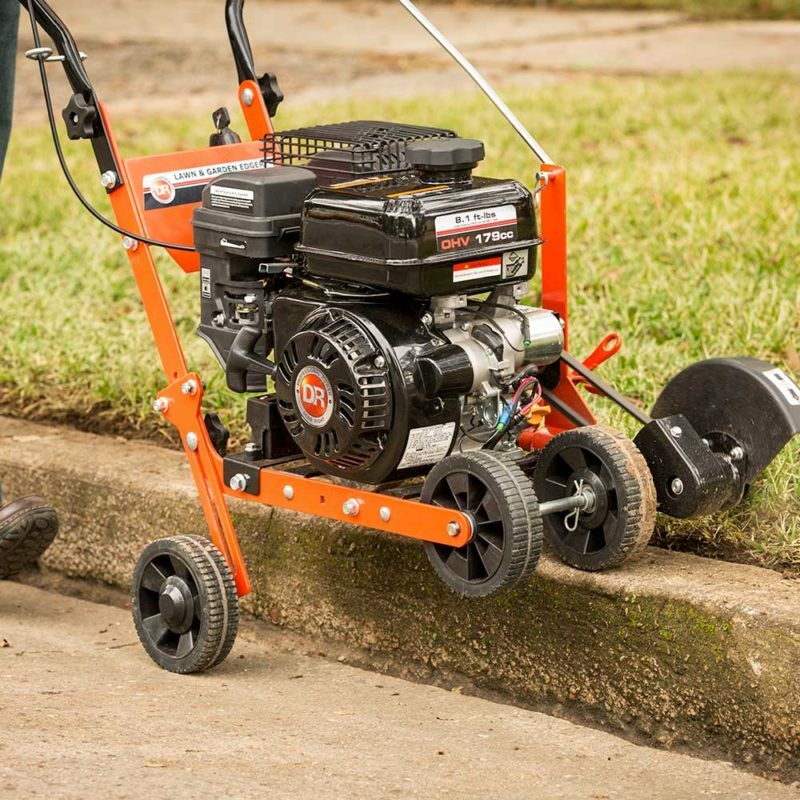 With a 4-wheel model like the DR PRO Lawn & Garden Edger, you have solid contact with the ground which provides a stable base for cutting edges from. As the operator, you are not in for any arduous lifting or exerting of downward pressure on the tool. You just steer the machine along and it does all the hard work. You are free to concentrate on keeping your line straight or guiding it along a curve. A step edger, usually with a blade in the shape of a half-moon, is designed to be stepped on with one foot. Your weight sinks the blade into the earth to create a cut. You can get good results if you are patient and willing to make a lot of cuts. Inexpensive (the “cost” is in your labor). Only a small portion (the center of the half-moon) cuts to full depth. You need to maneuver the handle from side to side to widen the cut or make a new step-cut every 2-3 inches. This style of edger consists of a rotary cutting blade attached to the end of a shaft with either one or two wheels. The idea is that you roll it along, pressing down on the shaft, and forcing the rotating blade to cut an edge. You can get good results if you are willing to go over your edges several times. Inexpensive (again the “cost” is in labor). The cuts are usually too shallow to last. If you don’t cut deep enough to start severing roots (2-3″) the edge will quickly grow over. If the cutting blade has a wide enough diameter to cut deeper, it is hard work to force it to the depth you want, and you may have to go over each cut several times. Wear and tear on you. The pressure applied by pushing down on the shaft with one arm extended is something you’ll feel in your shoulders and neck. Many string trimmers have heads that can be rotated 90? so you can run the string vertically instead of horizontally. You can get good results if you don’t mind doing it frequently. As with a manual wheeled edger, the cut tends to be superficial. If you don’t cut deep enough to start severing roots (2-3″) the edge will quickly grow over. You need to be careful that the discharge doesn’t flay your legs because, on many string trimmers, the protective shield is configured for trimming and doesn’t do a good job of protecting the operator when used in edging mode. 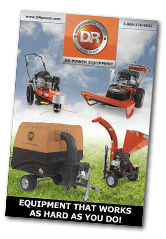 With a string trimmer, there is no point of contact with the ground to anchor your movement. As the operator’s arms tire it’s easy to wobble…and get a wobbly edge as a result.